I first visited the land of the Maya in October of 1979. This was a life altering journey for me when several events there made me remember what my true mission in life was: To solve the Mayan calendar and communicate its deeper meaning to modern people. At this time there existed no clarity whatsoever about the meaning of the Mayan calendar and tour guides and archeologists invariably would say that this was merely a superstition. Nonetheless, I could then read in Michael Coe’s book The Maya that their calendar would come to an end in 2011 and at this time the very first tentative efforts to understand this were made by pioneers such as Tony Shearer, Frank Waters and Peter Balin. A sense thus started to surface that the Mayan calendar held information that the rest of the world had been oblivious to. Yet, that the Mayan calendar would outline a cosmic time plan that could be verified by events in human history was still far down the road and for someone who today begins to take an interest in this field it may not be so easy to realize how vague the inferences were at this time. Regardless, as I returned to Stockholm after this journey I mentioned in a lecture to colleagues that the Mayan calendar would be coming to an end in 2011, which indeed was very early in the history of our understanding of the Mayan calendar. In this journey it was very important for me that I had contacts with Mayan women who were weavers, and sold, and sometimes gave!, their creations to me. For Mayan women weaving is not only a practical activity. While visitors to the area can enjoy their skillfulness and the choice of lively colors and elaborate patterns not everyone knows the deeper meaning of the webs they are creating. In fact, weaving is the particular way in which Mayan women express their cosmovision, which often goes back to ancient symbolisms and patterns which are related to the calendar and its associated mythology. Hence, when after this journey I came back to my small little apartment in Stockholm and put these textiles up on the walls they came to be a constant reminder of the Mayan cosmovision also during the many years I continued with my scientific career. As I myself come from a family that previously have been weavers for fifteen generations this form of art spoke very directly to me. As is well known much of the knowledge of the Mayan calendar system was lost as the Classical Mayan culture came to an end more than a thousand years ago and so not only does this system have to be retrieved, but also its associated cosmovision. Christiane Biebl is a woman from German who has taken to heart the Mayan role of weaving for expressing a true understanding of time. It is thus appropriate at this particular time when the Mayan calendar is approaching its end on October 28, 2011 how she has expressed her cosmovision. 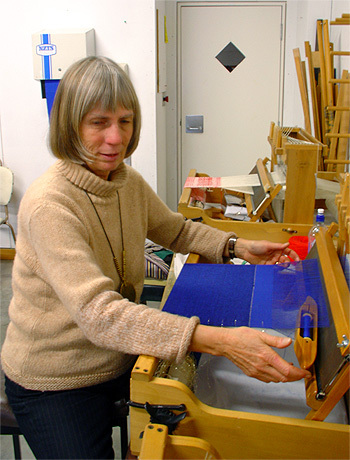 Her loom in fact mirrors the acceleration of time with a meticulous exactness as she has created a loom of 1,872,000 lines (the same as the number of days in the so called Long Count or sixth wave). The alternating shades of the colors reflect the days and the nights of the sixth, seventh, eighth and ninth waves of evolution and all ends up in a rising sun at the end of Mayan time. Christiane has here retrieved the original Mayan way of using weaving for expressing cosmovision in a most amazing way, but with the exactness of our modern understanding of the calendar. 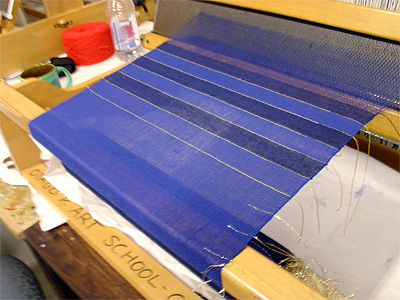 The art of weaving has here been used not only for beauty, but also for communicating knowledge and cosmovision to the viewer. The central role of weaving to the Maya is also evident in the fact that the Mayan day sign Chuen, Batz or Monkey depending on language, is often seen as the “weaver of time.” This is the central day sign, number 11 of the 20, if you count as the ancient Maya did, or number 1 if you count as the contemporary Quiche Maya do, who start their tzolkin at 8 Batz. Christiane’s work is a very directed expression of this weaving of time and so was presented as a gift to Don Alejandro Oxlaj at the Return of the Ancestors gathering in Sedona in 2009. I feel on my own part that the ancestors may very well be returning through this form of retrieval of the web of life and time. While the intricateness of the work may not be immediately clear through these images I hope the reader can feel its message and I hope it will be possible to share this more broadly in the future.